Whenever Google releases a new OS, its very time consuming and costly process for the device manufacturers to give the latest update to all its models. So what they do till now is that, they are forced to give latest updates to mostly its flagships and that too only for 1 or 2 major updates. In the end, most users will be stuck in the old version of Android. Still many users are stucked in Kitkat and Lollipop even though their device might support new android versions. Google has been working closely with device manufacturers and silicon manufacturers to solve this problem and thus came with a solution for this issue with the Android Oreo and that’s called as Project Treble. With project treble google aims to bring android updates to end users faster than the current situation. The android 8. has undergone major re-architecture to its android framework, to incorporate faster android updates. Sadly treble is only for new devices coming with Android 8.0 only. So users who are below Android 8.0 should either need to buy a new device with Android 8.0 or wait for the OEM’s to give the new updates, which might not happen. Those devices which has been shipped with Android 8.0 out of the box are required to support project treble. But if your device is updated from an older version to Android 8.0, your OEM might need to support project treble in it. 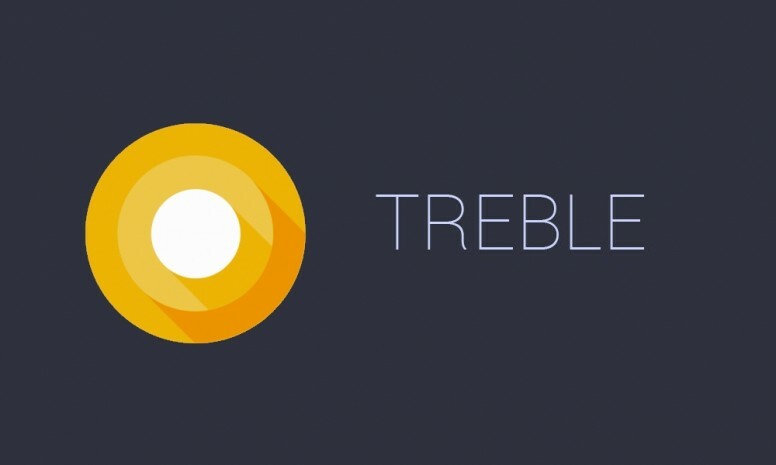 So its upto the OEM to decide whether it will be supporting the project treble in its Android 8.0 ROM’s which has been upgraded from older versions. So what is Project Treble Actually? Before understanding that, we need to understand the release process of an android version. 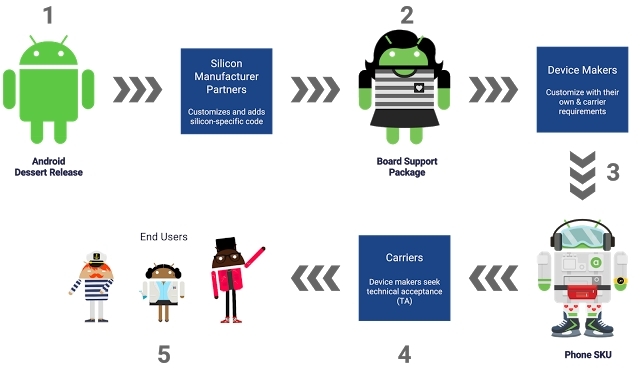 Every new version of Android release requires a number of steps before getting it to the hands of the users and it is shown in the image above. Google's Android Team develops the Android & publishes and releases the source code to the world. Chipset makers modify the source code for the working of their chipsets. Device manufacturers then use the modified source code from the chipset makers and then designs their UI and modifies the source code given by the chipset makers, so as to use it in their devices. Device manufacturers then work with the carriers to test and certify their new release. For each region, the network bands provided by the carriers are different. So the device manufacturers has to make sure that their device works in without any issues in the region they launch their devices. By the implementation of Project Treble from Android 8.0 Oreo onwards, Google plans to reduce the time and cost involving the release of new android versions. When android was released firstly in 2007, google created the compatibility program for the developer API which was specified by the Compatibility Definition Document (CDD) and its associated Compatibility Test Suite. This helped the developers to create apps, that works in many devices with different hardwares. By this way, it reduced the workload, time and cost of development of android apps. So with the help of these Android Apps works fine in the Android OS framework. The major problem and time consuming step is that vendors such as silicon manufacturers and chipset makers need to work on a lot of code whenever a new android version is released. So device manufacturers need to wait for the source code from these silicon manufacturers. This might delay the release of new android versions. To avoid this issue, google has separated the the vendor implementation the device-specific, lower-level software written in large part by the silicon manufacturers from the Android OS Framework. 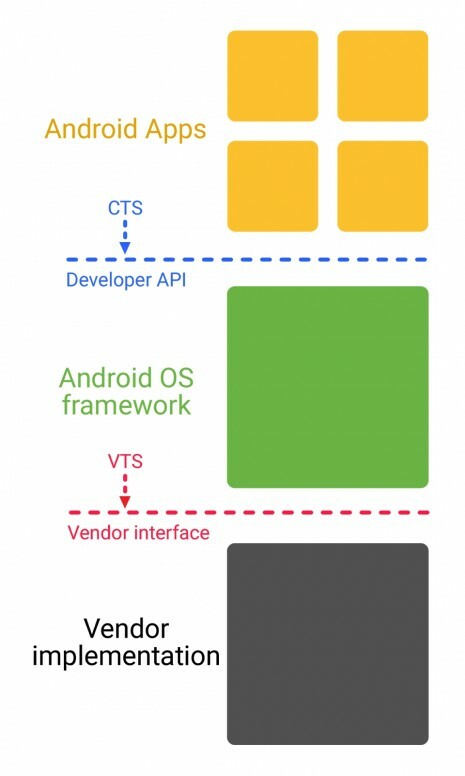 Google has introduced a new vendor interface between the Android OS framework and the vendor implementation. The new vendor interface is validated by a Vendor Test Suite (VTS), similar to the CTS, to ensure forward compatibility of the vendor implementation. As part of the Vendor Test Suite (VTS), all Treble-enabled devices must be able to boot a raw, generic AOSP build. Now with android 8.0 onwards, there will be a vendor interface which provides access to the hardware specific parts So the device manufacturers can update the android OS framework, without waiting for the code from the silicon manufacturers. So the original vendor implementation doesnt need any modifications and only the android OS framework must be modified for the newer android versions. Whereas it was not the case earlier. Earlier device manufacturers need to wait for the code from the chipset makers. The chipset makers thus has to work on each and every new android versions and make it work for the device OEMs. Project treble will be coming with all the devices that comes with Android Oreo out of the box. and will continue to the next android versions too. So, Whats the real importance of Project Treble in Custom ROM development? Project treble is really helpful for custom rom development. It will help the developers to boot a raw generic AOSP build into a project treble enabled device. Due to the project treble OEM's will ship devices that can boot AOSP without any issues and custom rom developers can utilise this to build new roms without messing the kernel source code.